The season runs August 27th - November 12 (12 weeks)! Practice days will be from 6:30-8:30 p.m. on August 27th, August 29th, August 31st, September 6th, Septermber 10th and September 13th at Club 1 Volleyball- 14407 Coil Plus Drive, Plainfield *If our numbers exceed the amount we can accomodate in one practice setting, we will slightly adjust the times on the set practice days to accomdate all. Teams will be selected and coached by a parent volunteer. Our volunteers will get a discounted price and a coaches meeting with lots of volleyball information. Each team will get 6 practices run by our club staff. Each group will learn fundamental skills as well as team play and team concepts. Additional practices are up to the individual team coaches. 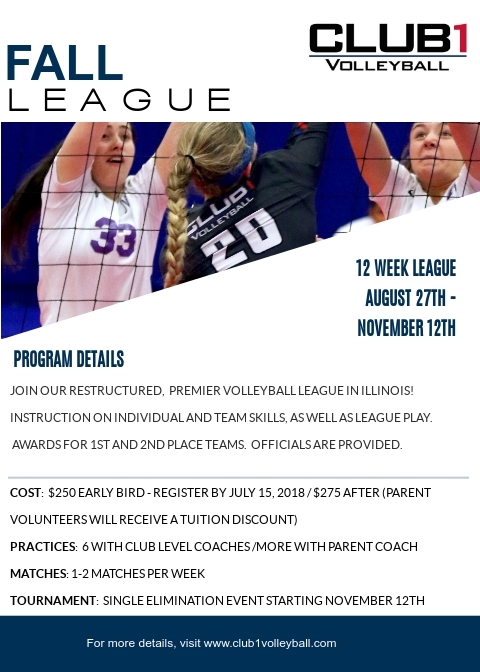 Teams will play 1-2x per week at Club 1 VBC (14407 Coil Plus Drive, Plainfield). Tournament play begins November 12th and is single round elimination. Awards for our 1st and 2nd place finishers. Officials provided.